“These solo fingerstyle guitar arrangements cover a wide spectrum of American music. 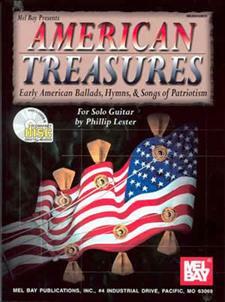 They include early hymns of the pilgrims, American Revolutionary war tunes, British folk ballads that later became colonial pop songs, sea chanteys, spirituals, Civil War tunes, pioneer frontier ballads, military hymns, and songs of patriotism. They were selected for their heartfelt melodies and their adaptability for solo instrumental guitar. While these arrangements seek to tap the rich polyphonic nature of the guitar, players of all levels will enjoy them and be richly rewarded with the music that is unleashed here. This collection offers an extensively researched musical snapshot of early America and a reminder of the amazing heritage of this great country. Written in standard notation and tablature.